I was thinking about pancakes recently. We have an electric waffle iron and we make waffles for breakfast periodically. I have never really made pancakes, however. 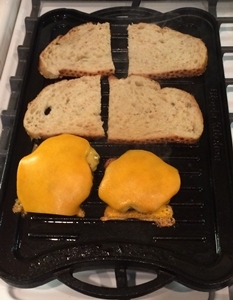 I thought that would be fun, but I didn’t want to buy an electric pancake grill when we had the electric waffle iron. I thought a stovetop grill would be a good idea so I checked with Terry. She agreed, but for a different reason. She had been looking at them and thought it would be great to grill chicken, fish, and beef inside when it was too cold, too wet, or even too hot outside. I turned to Amazon (of course) and found an economical reversible grill that was just about the right size for our stove, and much less expensive than the ones that were a bit larger and would have probably been too big for our stove anyway. I ordered it. 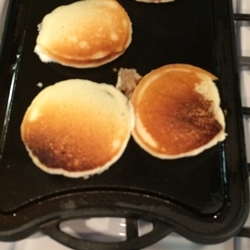 I was a bit concerned about the pancake side of things (pun intended) as one of the Amazon reviews said the flat side was rough. I made pancakes the day after the grill arrived, however, and I was absolutely delighted with the result. That evening I made hamburgers on the side with ridges and they were marvelous as well. The grill is cast iron, so with proper care it will last forever. It is a bit hard to clean, as is most cast iron, but for the cooking that we can do on the grill it is well worth the effort. We made a great addition to our kitchen at a very reasonable price. Cast iron when you need a big fat heat source, as when grilling or searing, or other hot, fast cooking is far superior to any other material. Seasoned, it cleans easily, and beats the heck out of “no stick” — one just needs to know the rules. Tocque’s off to you.